The cold grey dawn crept over the headland. The one-eyed man drew his bearskin cloak around him and stared out at an empty sea. Not a single sail broke the horizon. Treachery, circumstance, or fate. It mattered not. The ships weren’t coming. He stood, shrugged off the bearskin and stretched. His breath was a thick white mist. A few short cycles of the moon... and it would have been over. His pursuers cheated of their prey, his reputation enhanced by a year of victory after victory, the banners of his enemies hung in his hall. But time had run out for Einar the Perpetrator. ...at the point of a sword. This game formed the climax of an ongoing campaign chronicling the blood feud between two Viking Jarls : Gunnar the Aggrieved, and Einar the Perpetrator. In Viking law, a man with an outstanding accusation of murder against him could be hunted down and slain with impunity for a year from the date of the accusation. If he could escape justice for that long, the Fates were assumed to have judged in his favour. Einar’s year of outlawry was almost over, and he’d thrived on it. At large and undefeated, this was to be his pursuer’s last attempt to have their vengeance. 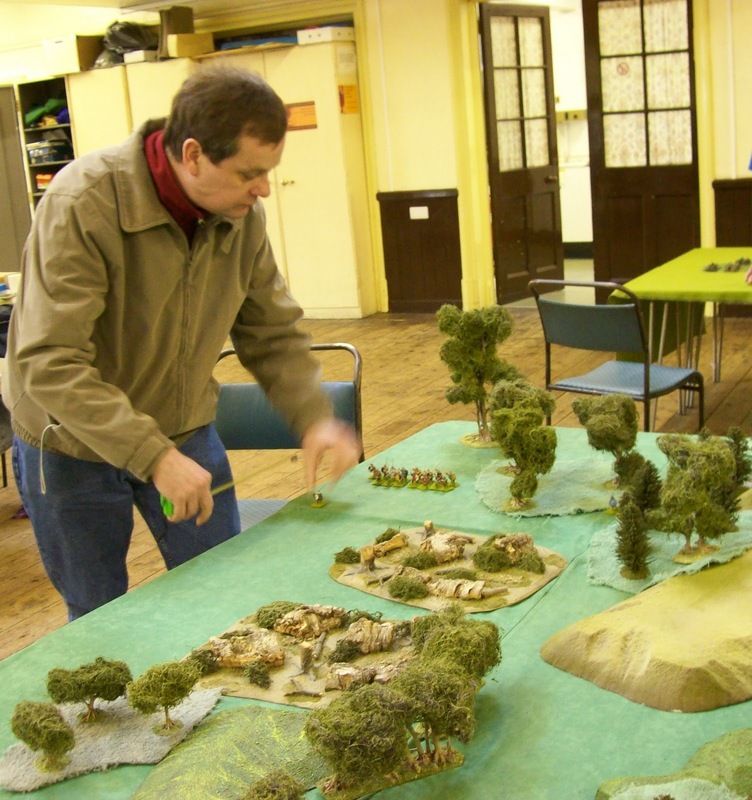 We were using ‘Sword & Dagger’, our club rules, by Richard (AKA ‘Gunnar’) available to download from Tyneside Wargames Club website. They’re 1:1 skirmish rules for Dark Age –High Medieval forces of around 40 men per warband/retinue. The points system and army lists had been substantially revised since our previous game, with drastic results for our force composition! A swashbuckling villain unashamedly modelled after Kirk Douglas’ character in “The Vikings”. His retinue had always been based around a solid core unit of armoured hirdmen with two-handed axes – but the rules revision had introduced random rolling for different troop and weapon types, and I had lost almost all my hirdmen on the turn of the dice! I fielded two units of spearmen (one my faithful Saxon mercenaries, who had distinguished themselves in the last outing) half-a-dozen Baresarks, a handful of archers, and a large mixed mob of raiders with swords and hand-axes in varying armour. Einar’s kinsman, therefore duty-bound to support him in the feud. Truth be told, I got the sneaking suspicion Guthrum disapproved of some of Einar’s more reckless exploits... but no-one could say he’d ever hesitated to take his place in the shieldwall! Guthrum was leading a scratch force of locals – mainly spearmen with a handful of slingers and two wandering Bezerkers. Presumably his own warband was engaged elsewhere. Still whinging a year later... tch, I ask you. If ‘Trisha’ was around in CE870, he’d have been on her show telling everyone how Einar done him wrong. Still, he’s a wrathful, hate-fuelled avenger in fine Nordic tradition, so it’s hard not to like the guy. Oh, and since he went to Novogrod he hasn’t stopped wearing ridiculous baggy pants. His force was composed of two solid spear units, with half-a-dozen slingers, a handful of armoured hirdmen accompanying Gunnar and his standard-bearer, and a handful of scouts. Trygg fielded the surprise of the day – his core unit of hirdmen were all mounted, with the majority of the rest of his force being light skirmish types, with good numbers of archers and slingers. 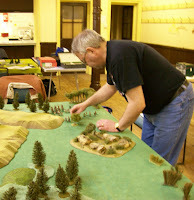 We played on a table roughly 4”x8”, with the long edges being N & S, the short edges E & W.
The terrain represented a low headland where Einar had been intending to take ship for Aengland, but had instead been trapped by Gunnar’s pursuing force. The westward end only was the landward edge; the rest of the table was surrounded by sea. The point of the set-up was to force Einar into an attacking strategy – a tough call, but only fair, since he had been able to dictate tactics in all the previous engagements. As seemed to make sense for any headland, the ground rose from the sea to its high point in the middle of the table, then sloped back down again. The low areas around the edges of the table were mostly salt-marsh, rough ground and reed-beds. Gunnar & Trygg deployed at the Western edge – Gunnar toward the SW, & Trygg toward the NW. Einer’s band ranked-up opposite Gunnar, and Guthrum opposite Trygg. Turns 1-3: All factions advance! All commanders decide to ‘go with the flow’ and follow the path dictated by the terrain – Einar and Gunnar marching toward each other in the stretch of open ground along the southern shore, Trygg and Guthrum heading for the open ground to the north. while his scouts and command group skirt the rougher ground toward the middle of the table. As Gunnar’s scouts advance, his slingers split off from the main group, and head for a dense patch of rough ground. Einar’s raiders advanced in loose mobs, seeing no point in close-order drill while still so far from the foe. Trygg’s initial advance sees his forces skirting some rough terrain. His highly mobile warband flows easily around the broken ground and forms up facing the widest stretch of open ground on the table: a potential killing ground for his cavalry and archers! sending his archers into the dense reed-beds which border the open ground. Einar’s warband organize themselves – his Viking raiders, best armoured of his men, will lead the advance. His archers form the second rank of this unit, and he slows his advance to half-speed to allow them to move-and-shoot. Although they score no hits, their shafts do make Gunnar think twice about leaving his men standing out in the open! Turns 5 & 6: The Slings and Arrows of outrageous fortune! Gunnar’s men abandon their shieldwall and crowd into the margins of the rough ground to the North – their left. In doing so, they cease their advance, content to wait for Einar to come to them. Some shuffling in Gunnar’s ranks sees his slingers come to the fore, peppering Einar’s lead elements for a couple of Light Wounds. His scouts press forward through some light woods and onto the slope of a small rise to Einar’s right. Trygg has established his slingers in a dense patch of rough ground and continues to advance the rest of his men. He continues to vex Guthrum’s scouts with hopeful long-range shots into the reeds, wounding a slinger in turn 5 and another in turn 6. Einar keeps pressing forward at a slow enough pace to allow his archers to keep shooting, taking a toll on Gunnar’s slingers. Although this will allow time for Gunnar’s scouts to close from the north, there seems little point in rushing forward – no matter how fast the outlaws march, they won’t outrun the enemy horse! Turn 7: Into the woods! Gunnar decides to deploy for battle in the rough ground. His men, taking cover at its edges, are redeployed across it. On Einar’s flank, Gunnar’s scouts come within range of the outlaws and their lone archer looses an arrow, scoring a Light Wound. Trygg’s tactics seem to be working. He leaves his skirmishers to whittle down Guthrum’s advance elements, and inclines his column of horse south – to his right – toward the impending clash between Gunnar and Einar! Guthrum has also made the decision to head south – but Trygg’s forces are still too close to ignore. He sends some light troops to the south, into rough terrain, but his main body use the round to redeploy with the stronger warriors to the right, to counter the threat of a charge. Einar presses forward! Continued archery from his advancing ranks forces a morale test from Gunnar’s slingers – they fail dismally and scatter! 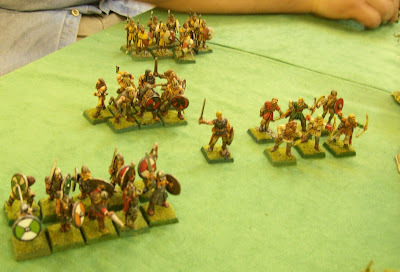 Einar diverts his Viking spearmen to charge Gunnar’s scouts. Although they pose no major threat, the narrow front on which Einar and Gunnar’s forces will meet means there’s no advantage to be gained by everyone getting there at once – therefore, nothing to be lost by a small diversion! Gunnar’s scouts, predictably, choose to evade the charge – only just managing to do so. Turn 8: Finally, the Clash of Arms! Realising that Guthrum is slipping his net, Trygg turns the screen of light troops which was holding him into a very orderly column, which follows his cavalry’s trail to the south. Eager to make up for lost time, Guthrum’s scouts rush through the broken ground to harry the flanks of Tyrgg’s column! Back at the southern edge of the headland, Einar’s spearmen again charge Gunnar’s scouts, this time, caught against the edge of a thicket, they have little choice but to stand, and battle is joined. The melee is inconclusive, with Gunnar’s archer the only casualty. Turn 9: The Main Event! Gunnar’s spearmen launch their attack from the rough ground, against Einar’s large mixed unit. The combat is absolutely brutal! The dice are merciless and wound after wound is dished out! Einar’s men respond by charging in their turn – the Saxon mercenary spearmen charge Gunnar’s command group, pinning them to prevent them joining the main fight, while Einar and his Berserkirs pitch into the flank of Gunnar’s spearmen! Trygg’s column rides toward the sound of battle, with Guthrum’s skirmishers still worrying at their flank; while Guthrum’s main force presses on some way behind. In the press of melee, Gunnar finds himself face-to-face with Einar! And, like many before him, has second thoughts when it comes down to it! He steps aside and waves his archers forward – such arrant cowardice comes to naught as Einar parries with his shield. Einar, too, has archers at his side – but he is made of sterner stuff! Einar charges into single combat! But the Gods of battle have other plans. After a year of constant pursuit, and repeated failure, on this bleak, marshy headland, Gunnar the Aggrieved has become Gunnar the Avenger. Even in death, Einar manages to cheat Trygg, who seethes at missing the kill! Guthrum has won renown for standing by his wayward kinsman against all comers. The warriors of rank from both sides of the feud gather as a Viking funeral is prepared, and flames leap into the grey sky to Wagnerian strains! Today’s victory belongs to Gunnar... but all present know that as long as this tale is told, men will know it as Einar’s Saga! Very good! - nice description of the rules in action - and some stunning pictures to boot - well done!